Small changes and May Challenge Update | That's London Baby! Its been a busy weekend for London Baby! Taking advantage of the great weather last weekend, London Baby has been out and about exploring two new sections of the Capital Ring and the lovely neighbourhoods of East Finchley and Muswell Hill. I have also been thinking on where to go with the blog and what type of content to write on in the future. While I enjoy writing about the Capital Ring, I don’t want to bore you with 15 massive posts and then retire 🙂 Taking into account the very helpful feedback I had from you lovely readers, and with the help of the lovely lady behind marketing blog Squirrels and Bears, I made some small changes to the blog, adding categories, pages and playing with the layout. All of this is work in progress but I hope you’ll enjoy the changes and the new content to come (hopefully soon!). 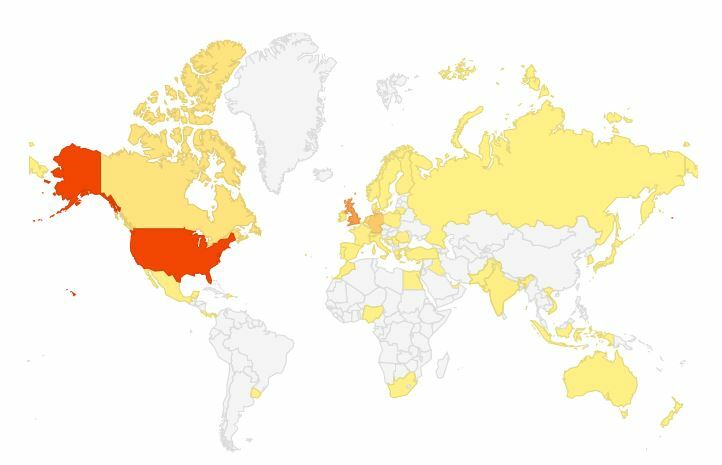 The May Challenge of getting a click around the world has also gotten a great boost from the session, and the tally is now an incredible 53 countries – showing the list is now too long but the map is really getting some colour! This is very exiting for me and I appreciate all those visitors so much. Thank you for sharing the page with your friends!